What Xero Triggers and Actions are Supported? New Payment - Triggered when you receive a new payment. New Contact - Triggered when you add a new contact. Create Sales Invoice - Creates a new sales invoice (Accounts Receivable). Create/Update Contact - Creates a new contact or updates a contact if a contact already exists. Create Purchase Order - Creates a new purchase order for a contact. Create Credit Note - Creates a new credit note for a contact. Create Bill - Creates a new bill (Accounts Payable). Create Payment - Applies a payment to an invoice. 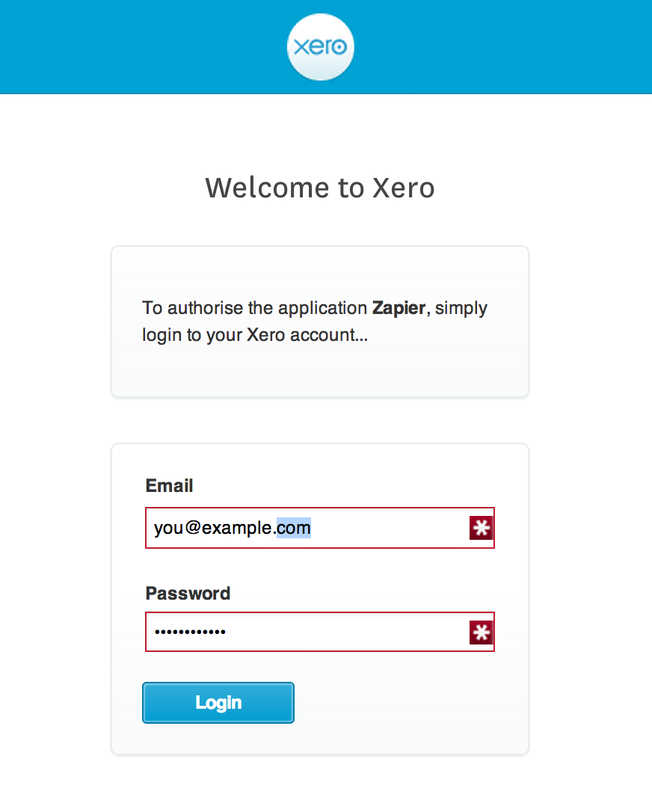 Next, Xero will ask you to confirm your intention to connect Xero to Zapier, just select whichever company you'd like to connect and click authorize. You'll be redirected back to Zapier automatically after that. Finally, your Account is added! We'll automatically test it and ensure everything is good to go. You can now continue to connect your account. In Zapier's Xero integration, the “New Payment,” “New Bill,” and “New Sales Invoice” triggers offer line item support, as do the “Create Bill,” “Create Sales Invoice,” and “Create Purchase Order” actions. The Xero account you're connecting with must have either Standard or Advisor level rights in order to use the Xero API, which is required for connecting with Zapier. Read-only, Invoice Only, and Cashbook Client roles don't have the ability to use the API. This can happen if a second connection to Xero from the same account has taken place. If, under a separate Zapier account, you try to connect to the same organisation in Xero, this will replace the previous connection. To resolve, only connect your Xero account to one Zapier account. Even though the field is marked Optional, Xero requires it in certain cases.